While there were 165 more listings in Antrim County in 2017, only 48% of the houses listed were sold. This number is down from the 56% of Antrim County listings which sold in 2016. However, many of the smaller areas had more sales in 2017. For example, Central Lake and Mancelona boasted an impressive 65% and 62% of “homes listed versus homes sold” in 2017. However, only 48% and 42% of homes listed in Bellaire and Alden sold in 2017. The average list price across Antrim County was $224,047, which is 1.6% more than 2016. The average Antrim County sale price of $209,054 was up just $519 from 2016. The average sale price across Antrim County was 93.3% of list price, down from 94.6% last year. Mancelona ($82,129) and Alden ($199,83) both showed decreases in the average sales price, while Bellaire ($166,150) and Central Lake ($142,549) both showed increases in average sales price. The fact that no one is in a hurry to buy continues to challenge realtors and sellers in this area! The average days on the market increased across Antrim County from 200 days in 2016 to 239 days in 2017. 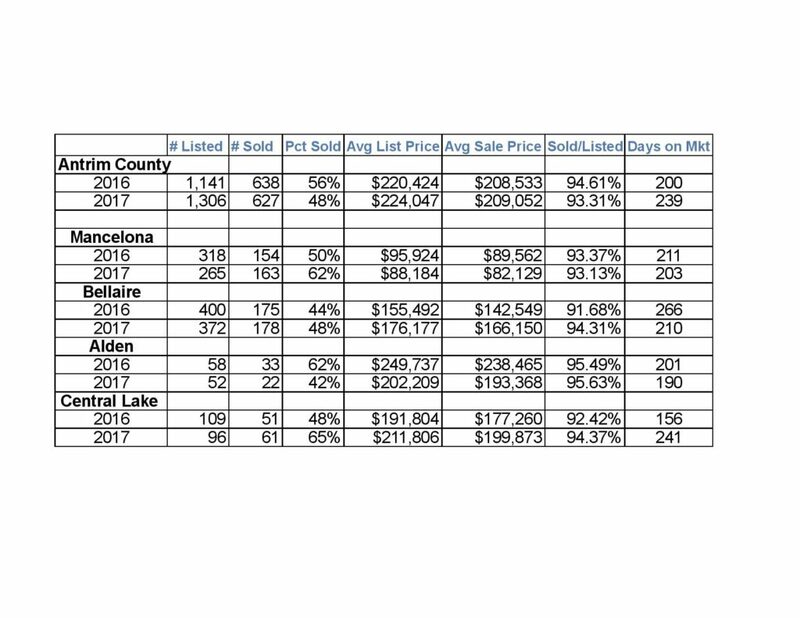 Averages days on the market in 2017 went down in Mancelona (203), Bellaire (210), and Alden (190), but went up significantly in Central Lake (241). So far, 2018 seems to hold a lot of promise, and will definitely be a great time to buy or sell. 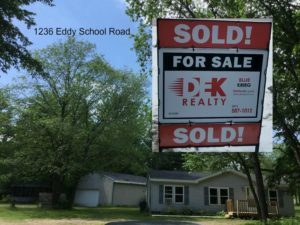 Please contact DEKrealty@gmail.com if you would like information on buying or selling real estate in northern Michigan.